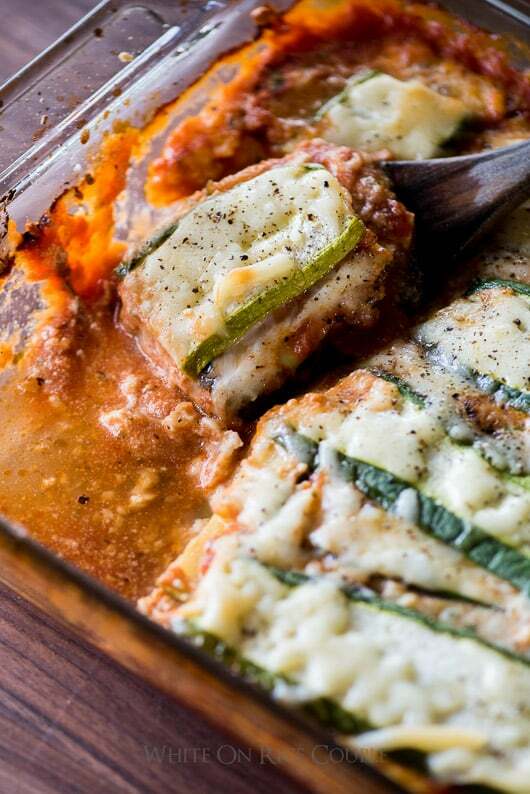 This zucchini lasagna recipe is literally lasagna without the pasta. It’s sheets of zucchini rather than lasagna pasta. The result is a delicious casserole that’s low carb and amazing. 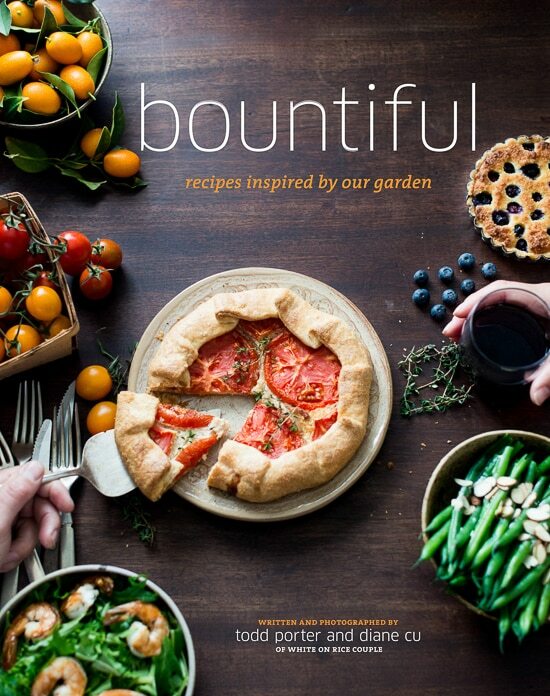 Summer of 2014 was a crazy zucchini year with 30 recipes we developed and we still have have 23 to share. 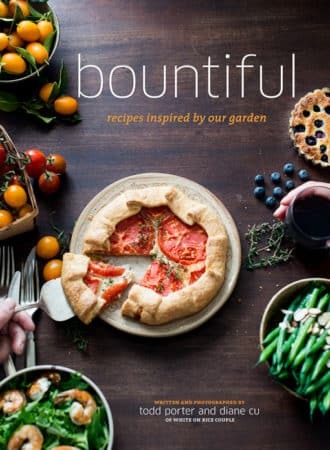 Another zucchini recipe? Sure, why not. 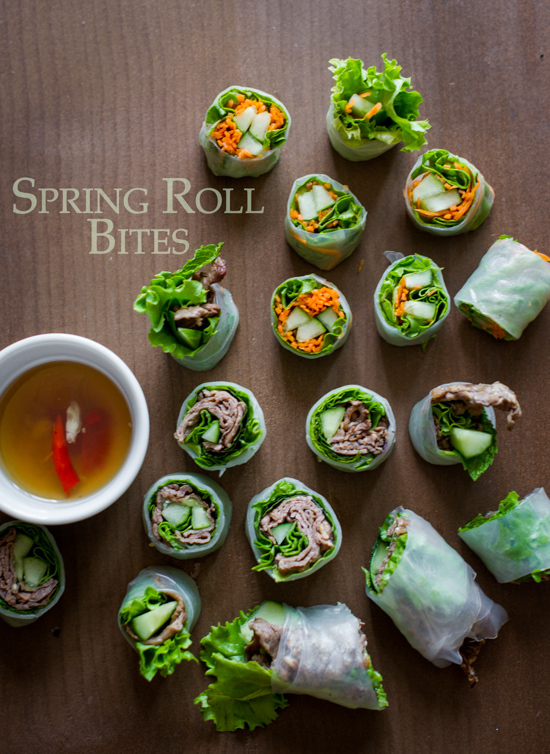 It’s such a versatile vegetable and it doesn’t hurt to add more veggies to our daily menu! A few months ago during lunch on-set everyone was talking about their favorite foods. It was a fun round of conversations because everyone had different favorites and of course, they all revolved around comfort foods. 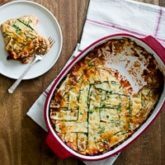 One of the food stylists mentioned that she “loves”, meaning all in caps “LOVES”, lasagna. We all had a moment of silence, followed by a unanimous “yes!”. It was quite a bonding moment when we all agreed (and almost forgot about), this favorite comfort food. Lasagna in any form or filling has to be up there on our list of comfort food favorites. It even holds high along side macaroni and cheese. What’s not to love about lasagna? They’re saucy, cheesy and perfect to fill with our favorite ingredients. The possibilities are endless when we can really start to think outside the basic fillings. 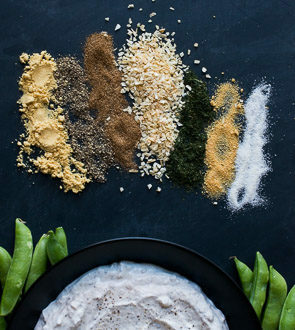 How about adding layers of quinoa or couscous for some healthier options without all the meat and cheese? Or even ground turkey instead of beef. How can you not get hungry just thinking about lasagna now? Video of No Pasta-Zucchini Lasagna Recipe : Actually, you’ll see two techniques! 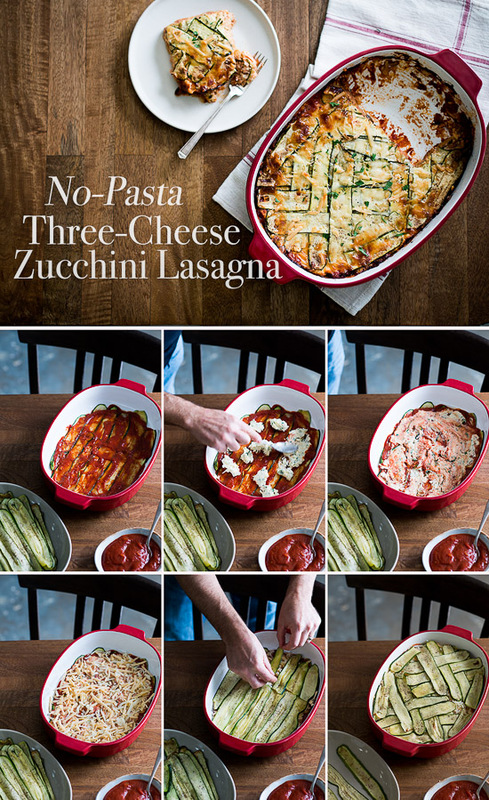 It was great that the topic of lasagnas came up because back on our 2014 zucchini project, we made this zucchini “no pasta” enchilada and it was a huge hit. What makes this less calorie and lower carb compared to traditional lasagna is that we didn’t use any lasagna pasta. Instead, we sliced the zucchini very thin length-wise and broiled them. Then we use those to replace the “pasta” in layering. Trust us, you really don’t miss all the pasta layers and will probably be glad to have some less carbs if you’re a double or triple-serving type of person. 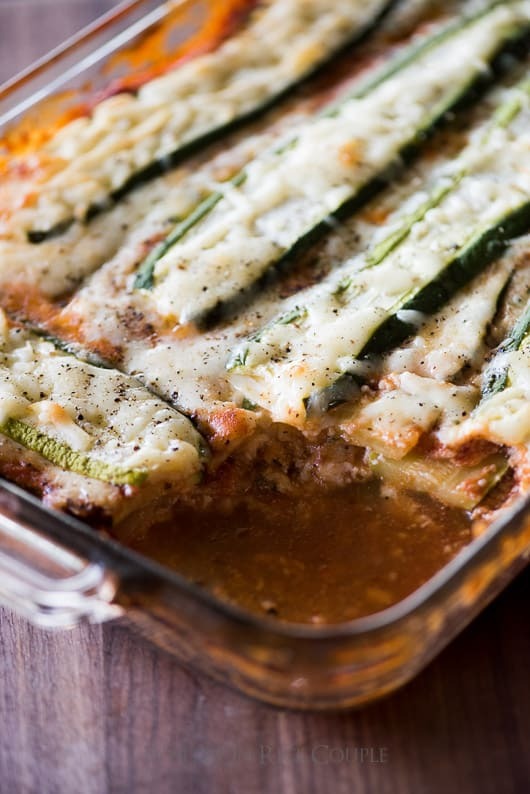 The only thing different with using the zucchini slices to replace the pasta in this zucchini lasagna is that you’ll have more water-release from the zucchini. 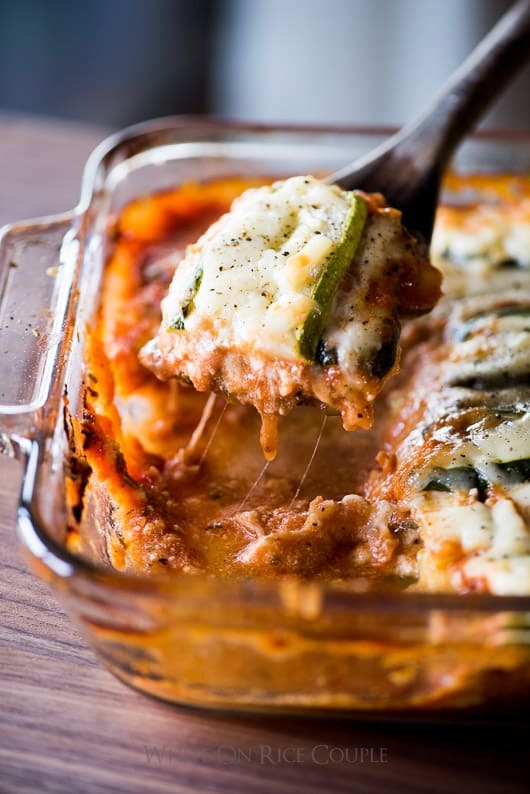 We made this zucchini lasagna dish again the next day for the crew and everyone loved it. They couldn’t believe that there was no pasta and best of all, it was lower in carbs and just as satisfying. We were obsessed and also made a enchilada version of this using the zucchini instead of tortillas. We’ll be posting the zucchini enchilada recipe soon! After cooling, you can drain some of the excess zucchini-water. Adjust baking time a bit shorter so zucchini doesn’t become too mushy. Some moisture from zucchini will release but not as much as using raw zucchini. Overall textures of the zucchini will be slightly softer, so don’t over-bake. Thanks to that awesome day in studio with all the stylists for reminding us how much we all love (but don’t eat often) lasagna. Now we need to make this zucchini lasagna again and serve beer on the side. Enjoy. 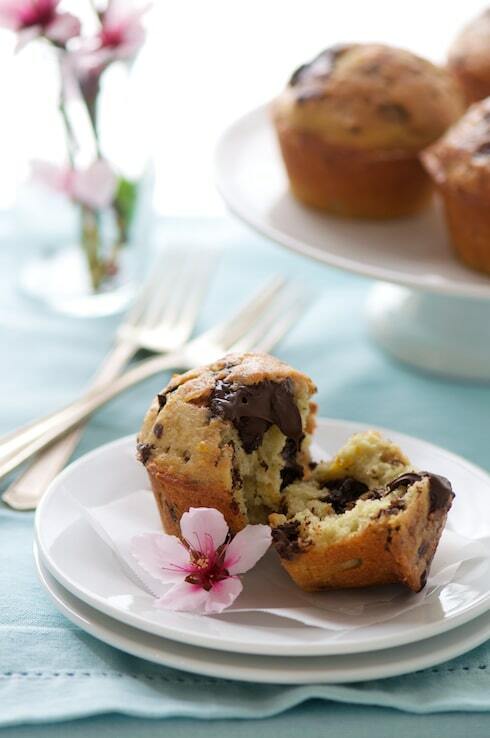 Here’s some more great zucchini recipes Here. Three Cheese Zucchini Lasagna "No Pasta"
One of the main differences with using the zucchini slices to replace the pasta is that you'll have more water-release from the zucchini. To help minimize moisture and water released from the zucchini after baking, you can pre-broil the zucchini slices first. 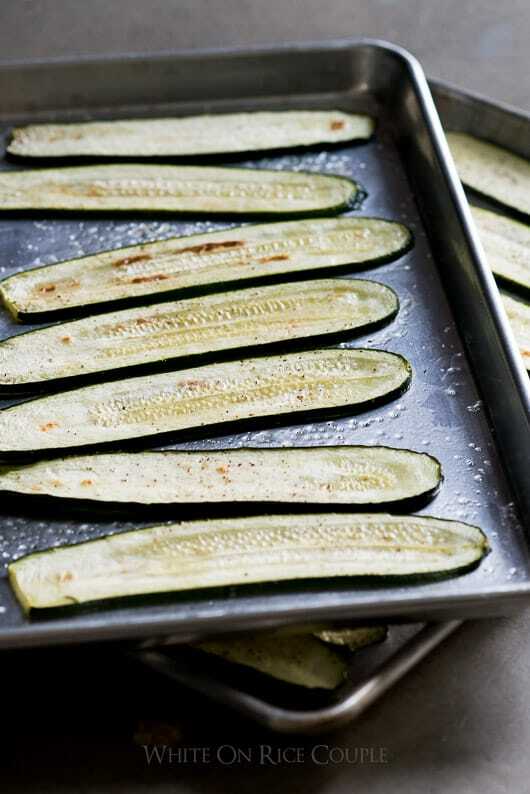 Broiling will help release a substantial amount of moisture and give add flavor to the zucchini. Water will still be released when the zucchini is pre-broiled, but it's not that bad. Also, the homemade tomato sauce is “thick” which reduces amount of water released. If you use canned sauce, drain out some of the moisture. We've tested both versions and both are great. But you need less lasagna cooking time if you pre-broiled the zucchini so you don't end up with zucchini-mush. 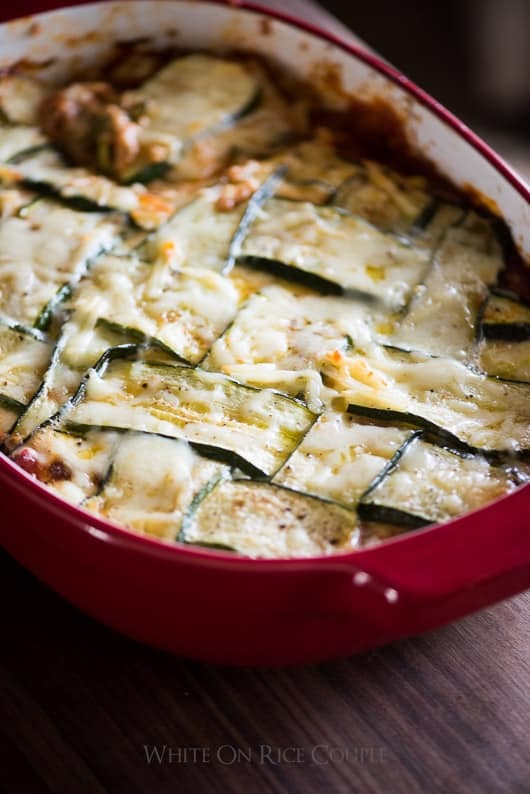 Usually the pre-broiled slice zucchini lasagna will be about 30 minutes, and the raw zucchini slice lasagna will be about 40 minutes, however every oven will vary so adjust accordingly to your own oven. 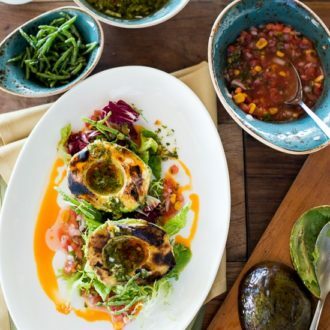 Personally, we prefer using the raw zucchini because the texture has a little more of and "al dente" bite and zucchini isn't too soft. But as mentioned above, it will have a bit more released water than the pre-broiled zucchini slices. Set the oven to broil at 500 degrees F with the rack about 5-inches from the element (usually the second position down from the top). 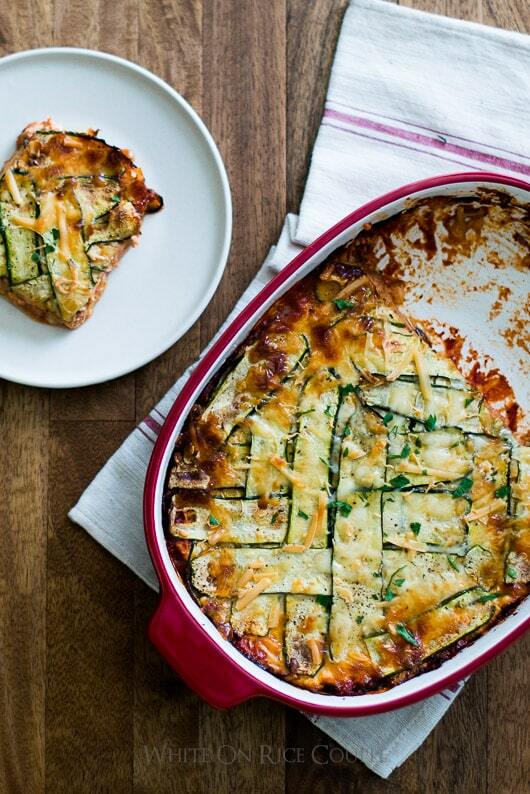 Lay the zucchini slices into single layers on baking sheet pans. (Do not line the baking sheet pans with wax paper or parchment. They will burn.) Lightly brush the zucchini slices with olive oil and season with salt and pepper. Flip over the slices and repeat for the other side. One baking sheet pan at a time, broil for 8 minutes, or until lightly brown. Remove from the oven and allow to cool slightly. Place the slices on paper towels to remove excess moisture. Heat a saucepan over medium heat, add olive oil and then add onions and garlic. Cook until translucent, about one minute. Add tomato sauce, tomato paste, sugar, thyme, basil, Worcestershire sauce, salt and pepper. Simmer on low for about 15 minutes or until the sauce begins to thicken. Add additional salt or seasonings to taste. Remove from heat and allow to cool. In a bowl, combine the ricotta, Parmigiana Reggiano cheese, egg, parsley, and black pepper. Mix until evenly combined and then set aside. In a 3-quart baking dish (9-inch x 13-inch dish) add a very light layer of tomato sauce. Then layer ¼ of the zucchini slices into a single layer covering the base of the pan. Add 1/3 of the tomato sauce, 1/3 ricotta mixture, 1/3 mozzarella and 1/3 of your final cheese choice. 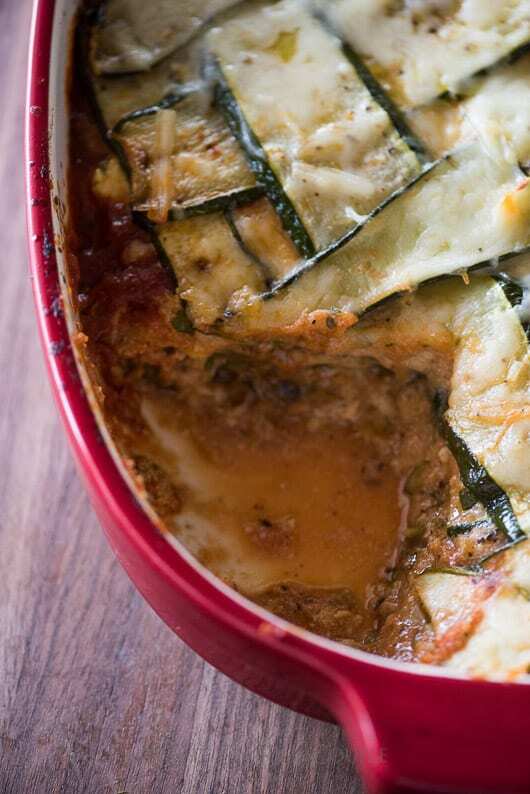 Repeat with the layering, until you end with the last layer with zucchini and a little bit of cheese (you should have 4 zucchini layers, and 3 layers with the ricotta and tomato sauce combination). Bake in oven for 30-40 minutes or until lasagna is baked through and cheese is melted. Allow to cool, then serve warm. *Note: If using raw zucchini slices, it will take a little longer to bake compared to the pre-broiled zucchini slices. If there is excess water release, you can soak it up with a paper towel. Top with optional garnish and serve warm. This lasagna impressed me. I have made a low carb version before but found it to be to watery. I broiled the zucchini and it was PERFECT. I would highly recommend this recipe, only thing I added was crushed red pepper right before serving. Hi Amaris! 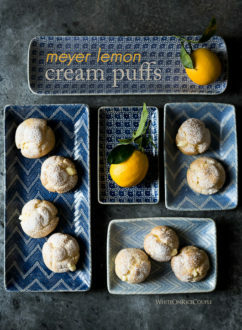 THANK YOU for the rec and for enjoying the recipe! My wife fixed and it was absolutely amazing; can not wait to see the zucchini enchilada recipe. Please do not forget! I love lasagna. 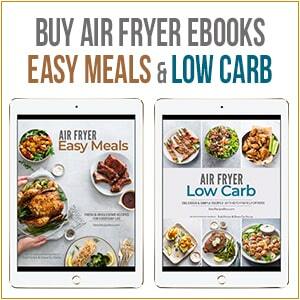 Perfect for my diet where I’ve eliminated most simple carbs like pasta. Would you know the nutrition facts per serving. I usually log all my meals and this would be a great help. Have you or anyone else tried sprinkling the sliced zucchini with salt and letting it sit for a bit before rinsing to remove excess water? I wonder if you would end up with a more al dente version like the raw with less water?? I absolutely love how you did a laytice top!